Paramedics And EMTs Confront Unconscious Racial Bias In Medical Care : Shots - Health News In a recent study of patients treated by emergency medical responders in Oregon, black patients were 40 percent less likely to get pain medicine than their white peers. Why? Talitha Saunders and AJ Ikamoto tidy their ambulance at the end of a recent shift. The two work as emergency medical responders in Oregon with American Medical Response in Portland. Leaders there are working to prevent any race-based disparities in treatment. Jamie Kennel, head of emergency medical services programs at Oregon Health and Science University and the Oregon Institute of Technology, led the research, which was presented in December at the Institute for Healthcare Improvement Scientific Symposium in Orlando, Fla. Outright discrimination by paramedics is rare, the researchers say, and illegal; in this case unconscious bias may be at work. A few years ago, Leslie Gregory was one of a very few black female emergency medical technicians working in Lenawee County, Mich. She says the study's findings ring true to what she has seen. She remembers one particular call — the patient was down and in pain. As the EMTs arrived at the scene, Gregory could see the patient was black. And that's when one of her colleagues groaned. "I think it was something like: 'Oh, my God. Here we go again,' " Gregory says. She worried — then, as now — that because the patient was black, her colleague assumed he was acting out to get pain medication. 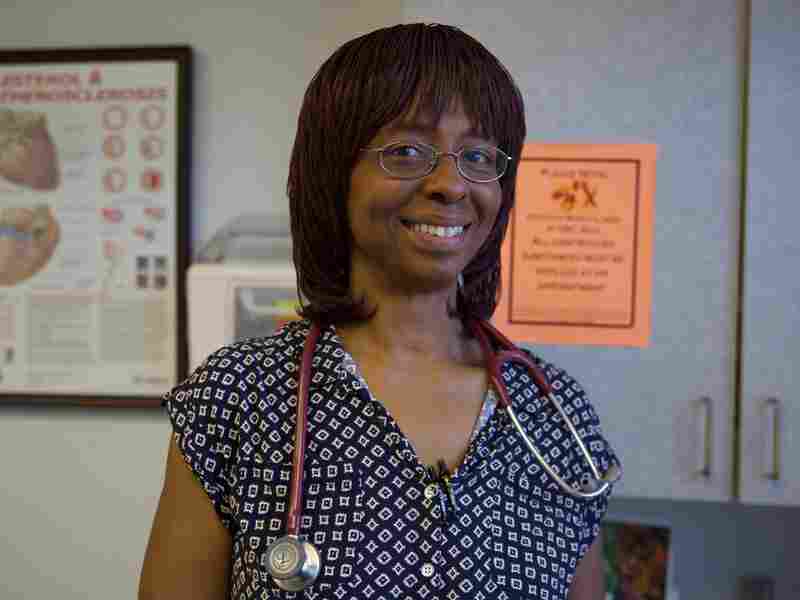 Leslie Gregory, a Portland physician assistant, asks, "How can a person of color not disrespect a system that is constantly studying and talking about these disparities, but does nothing to fix it?" She wants the CDC to declare racism a threat to public health. "I am absolutely sure this was unconscious," adds Gregory, who now lives and works in Portland, Ore. "At the time, I remember, it increased my stress as we rode up on this person. Because I thought, 'Now am I going to have to fight my colleague for more pain medication, should that arise?' "
Unconscious bias can be subtle — but, as this new report shows, it may be one of factors behind race-linked health disparities seen across the U.S. The study looked at 104,000 medical charts of ambulance patients between 2015 and 2017. It found minority patients were less likely to receive morphine and other pain medication compared with white patients — regardless of socioeconomic factors, such as health insurance status. Gregory is now a physician assistant, and one of her current patients, a black veteran, has cyclic vomiting syndrome. That means he periodically experiences bouts of vomiting he can't stop without hydromorphone, a potent opioid. If the man doesn't get the medicine when he needs it, he could rupture his esophagus and die, Gregory says. So he doesn't call the ambulance anymore. Instead, he goes straight to a hospital emergency department for help. But, Gregory says, the same thing keeps happening — the health professionals in the ER won't prescribe him the medicine he needs. "I took his entire medical record and faxed it over to the emergency department director of a local hospital system, in anticipation of this very problem," Gregory says. "And still, when he presented, it was the same exact thing." During a shift change at American Medical Response headquarters in Portland, I discuss the problem with EMTs and paramedics who are getting their rigs ready for the next shift. 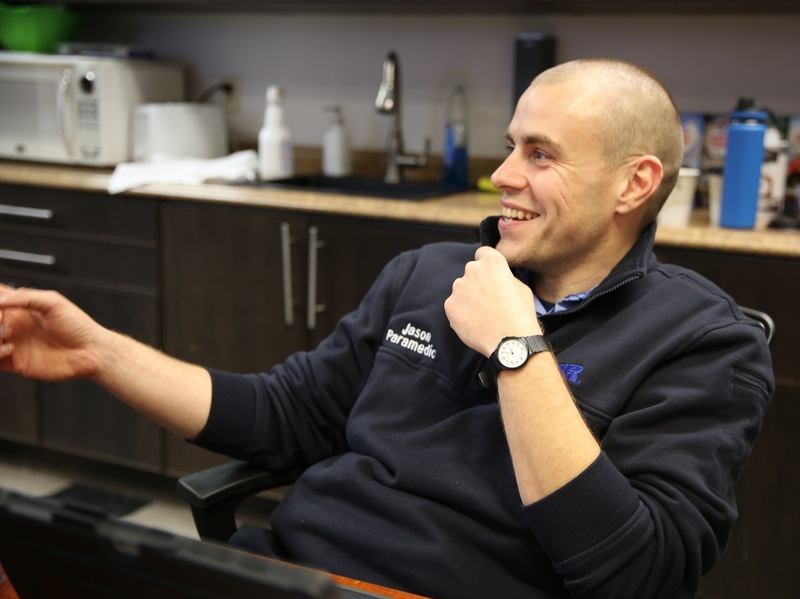 Paramedic Jason Dahlke says he can see how unconscious bias could slip into an emergency responder's decisions and taint health care. He has worked hard to be aware of it, in hopes of preventing those disparities in care. Jennifer Sanders, who has been a paramedic for 30 years, tells me she has heard about the new study. She is adamant that her work is not affected by race. "I've never treated anybody different — regardless," says Sanders. Most of the emergency responders I speak with, including Jason Dahlke, say race doesn't affect the treatment they give. But Dahlke also says he and some of his co-workers are thinking deeply about unconscious bias. "Historically it's the way this country has been," Dahlke says. "In the beginning we had slavery and Jim Crow and redlining — and all of that stuff you can get lost in on a large, macro scale. Yeah. It's there." Ask Dahlke where he thinks unconscious bias could slip in, and he talks about a patient he just treated. When Dahlke arrived at the patient's house, he followed standard procedure and gave the patient a blood glucose test. The results showed that the man's blood sugar level was low. "So it's my decision to treat this blood sugar first. Make sure that number comes up," Dahlke says. Dahlke says he did not address the man's pain in this case because by the time he had stabilized the patient they had arrived at the hospital — where it was the responsibility of the emergency department staff to take over. "When people are acutely sick or injured, pain medication is important," Dahlke says. "But it's not the first thing we're going to worry about. We're going to worry about life threats. You're not necessarily going to die from pain, and we're going to do what satisfies the need in the moment to get you into the ambulance and to the hospital and to a higher level of care." Dahlke says he is not sure whether, if the patient had been white, he would have administered pain medicine, though he doesn't think so. "Is it something that I think about when I come across a patient that does not look like me? I don't know that it changes my treatment," he says. Asked whether treatment disparities might sometimes be a result of white people being more likely to ask for more medications, Dahlke smiles. "I wonder that — if, in this study, if we're talking about people of color being denied or not given narcotic medicines as much as white people, then maybe we're overtreating white people with narcotic medicines." Research has also found African-Americans more likely to be deeply distrustful of the medical community, and that might play a role in diminished care, too. Such distrust is understandable and goes back generations, says Gregory. "How can a person of color not disrespect a system that is constantly studying and talking about these disparities, but does nothing to fix it?" she asks. Past declarations of crisis — such as those focusing attention on problems such as smoking or HIV — have had significant results, Gregory notes. But the CDC told Gregory, in its emailed response, that while it supports government policies to combat racial discrimination and acknowledges the role of racism in health disparities, "racism and racial discrimination in health is a societal issue as well as a public health one, and one that requires a broad-based societal strategy to effectively dismantle racism and its negative impacts in the U.S."
Kennel says false stereotypes about race-based differences in physiology that date to slavery also play a role in health care disparities. For example, despite a lack of any supporting science, some medical professionals still think the blood of African-Americans coagulates faster, Kennel says, citing a recent study of medical students at the University of Virginia. Another question in the survey asked the students whether they thought African-Americans have fewer pain receptors than whites. "An uncomfortably large percentage of medical students said, 'Yes, that's true,' " says Kennel. 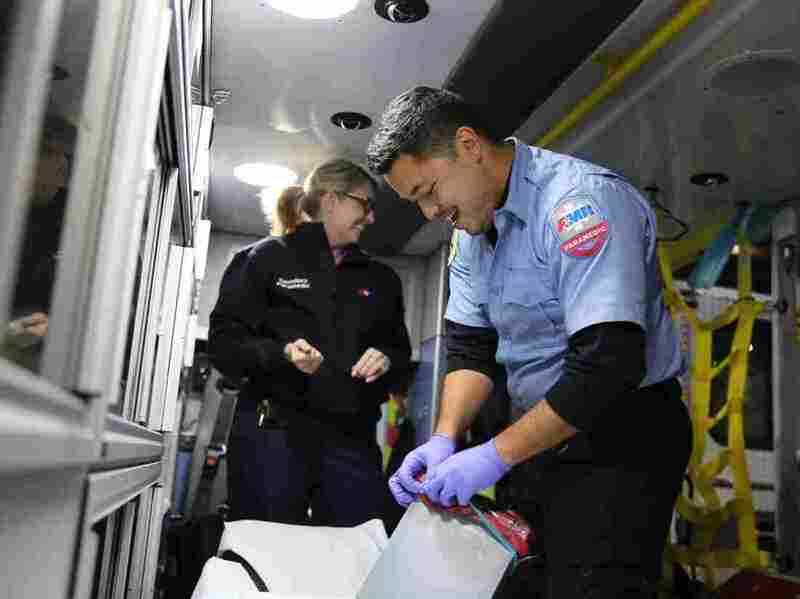 On top of that, he says, EMTs and paramedics often work in time-pressured situations, where they are limited to ambiguous clinical information and scarce resources. "In these situations, providers are much more likely to default to making decisions [based] on stereotypes," he says. Disparities in health care are well-documented. Whites tend to get better care and experience better outcomes, whether they're in a doctor's office or the ER. But before Kennel's study, nobody knew whether the same was true in the back of an ambulance. And they nearly didn't get to know, because the research required ambulance companies to release highly sensitive data. "We were prepared to maybe not look that great," explains Robert McDonald, the operations manager at American Medical Response in Portland. AMR is one of the nation's largest ambulance organizations, and it shared its data from more than 100,000 charts with Kennel. Some people chalk up the disparities he found to differences in demography and health insurance status, but Kennel says he controlled for those variables. "My feeling is we're probably going to put some education and training out to our folks in the field," McDonald says. In addition, he says, AMR is going to hire more people of color. "We want to see more ethnicities represented in EMS — which has historically been a white, male-dominated workforce," McDonald says. AMR's policies must change, too, he adds. The company has purchased software that will enable patients to read medical permission forms in any of 17 different languages. And the firm is planning an outreach effort to communities of color to explain the role of EMS workers. This story is part of NPR's reporting partnership with Oregon Public Broadcasting and Kaiser Health News, a nonprofit news service of the Kaiser Family Foundation. KHN is not affiliated with Kaiser Permanente.